Fans of the author will welcome these four novellas for their familiar themes and rich characters. Gordon (The Love of My Youth, 2011, etc.) visits familiar territory from her 36 years of fiction, criticism and memoirs: faith sustained or lost, father figures and mentors, unreliable lovers and the power that two people exert or inflict on each other. For this collection, the pull of the past figures prominently. A former student of Simone Weil meets the French philosopher in New York in 1942 and is confused to encounter a brilliant intellect now imbued with mysticism and life-saving schemes and questions her own choice of family over career. In Fine Arts, a graduate student eases her path to scholarly achievement by sleeping with her married mentor. After he breaks it off, she discovers the beauty in her chosen artist’s work in Lucca, Italy, and acquires a fairy-tale benefactor. A 90-year-old man remembers himself as a callow high schooler in Gary, Indiana, chosen to introduce Thomas Mann at a lecture in 1939 and learning about imported cheese, literature and Nazi atrocities. In the title story, the best of these novellas, a wealthy elderly woman is visited in New Canaan, Connecticut, by the husband she ran from 50 years earlier. It begins with the nicely drawn fear and vulnerability aroused by a strange truck parked near her house. It’s the old beau’s van, and his surprise visit sparks memories of a time when love took her with him to his crowd in Ireland. There, his small lies led to a bigger one, amid other things that weren’t what they seemed. In retrospect, though, she wonders what she lost by fleeing home to safety and certainty. 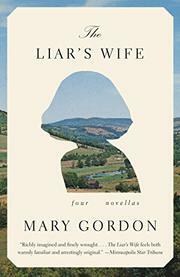 What Gordon sometimes lacks in subtlety is often made up for by the passion and energy of a questioning mind made all the more vital as she ages with her characters.